My assets are tax diversified partly as a result of happenstance. But now that the concept is becoming more popular, I am embracing tax diversification as a potential strategy for cost savings and asset preservation. What is tax diversification? It's holding investments within accounts that have differing tax treatments. More importantly, why does tax diversification matter? With appropriate diversification, I may have greater opportunity to control my tax bill during retirement and even before retirement. By limiting my tax bill, I could possibly reduce my overall expenses and preserve more of my wealth. There are many nuances relating to various account structures and tax laws. For starters, when I reference tax-deferred or tax-exempt, generally I am referring to treatment of federal income taxes. Very often, state income tax treatment is the same but not always. Further, investments in these accounts could incur taxes that aren't typically income taxes. For example, I may have to pay property taxes on my primary residence or intangibles tax on securities held in a regular brokerage account. In retirement, I may owe taxes on Social Security benefits if my combined income reaches a certain threshold; and combined income may include tax-exempt interest from municipal bonds. Also, there are quirky rules associated with owning and funding some of these accounts. For example, if I don't have a high-deductible health insurance policy, then typically I can't get a health savings account (HSA). Roth 401(k)s or even 401(k) plans may not be available at my employer. Finally, in some years, I could make too much money to contribute to a Roth IRA. Tax laws are complex and subject to change. The point of tax diversification is to position assets in a way that provides flexibility in various scenarios. These situations may include times when the rules change, I have an unusual tax situation, or I want to limit my tax liability. So, let's consider how withdrawals from various accounts, done strategically, could be beneficial. 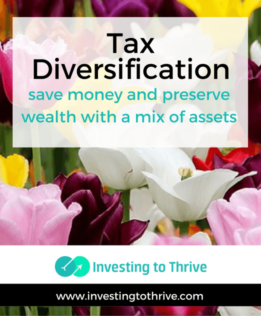 When I first thought about tax diversification, I considered how having accounts with various structures could be beneficial in retirement. But then I realized that it could be helpful well before retirement. Let's say I'm young but I've been able to accumulate investments now valued at $50,000. Let's look at what would happen if I needed $5,000 to pay for medical bills and $10,000 to buy a car. If I had money in a variety of accounts, I could largely avoid incurring income taxes on my withdrawals. On the other hand, if I had saved within a traditional 401(k) plan at work, then I'd have a more difficult time accessing my money. I could easily pay medical bills with money inside of my HSA. I've already gotten a tax break for putting money in the HSA and now I'm avoiding having to pay income taxes on the withdrawal for qualified medical expenses. In addition, taking money out of my regular brokerage account is pretty easy. Let's say I bought shares of Company ABC for $5,000 a few years ago and now they're worth $10,000. I may owe capital gains taxes on the $5,000 gain (proceeds less cost) but my tax rate could be as low as 0% if married and my joint taxable income with my spouse is as low as $74,900. On the other hand, in scenario B, all of my money is held in a traditional 401(k). Depending on the plan's design and the amount of my bills compared to my income, I may be able to claim a hardship to withdraw money for medical bills. But typically I'll pay taxes on the early distribution at my ordinary income tax rate and possibly owe a 10% penalty. So, being tax diversified could save me hundreds or thousands of dollars depending on my unique tax situation. In retirement, I'll also withdraw funds from my accounts though typically won't incur penalties. The White Coat Investor describes a scenario in which retired physicians both withdraw $100,000 in one year but incur dramatically different tax bills due to diversification. In my illustration, I'll consider what could happen if a married retiree generated an annual income of $45,000 with $5,000 designated for healthcare expenses. Funds from the Roth IRA and HSA are tax-exempt. Money from the traditional IRA is subject to income tax. But if this retiree is married and the couple takes the standard deduction, married filing jointly of $12,600 and personal exemptions of $8,000 (2 persons x $4,000), then the taxable income should be $0. In a different scenario, if a retiree had withdrawn all living expenses from a traditional IRA, then the taxable income would be $24,400. Using tax tables published in Forbes, income tax on this withdrawal could be $3,198.75 [$922.50 + ($24,400-9,225)x.15%]. Now, my withdrawals and tax bills in retirement probably won't work out this neatly. But having tax diversification should still help me control taxes in the future. Controlling taxes could allow me to spend less, withdraw less money held in investments, and preserve wealth. Still, everyone's situation is different. These scenarios consider only the tax treatments of money being withdrawn either before retirement or during retirement. Savers and investors may have benefited from tax savings when they made contributions to traditional IRAs and traditional 401(k)s, leading to bigger balances. My point is not to suggest a specific course of action relating to tax diversification or an even split of funds among accounts with various tax classifications. My purpose in discussing tax treatment of various types of accounts and offering these illustrations is twofold: 1) explain the concept of tax diversification and 2) explore the possible benefits of tax diversification. Knowing about tax diversification is useful as I plan on my own or work with a team of financial advisors, planners, and tax professionals. Have you intentionally used tax diversification as a planning strategy? Are you considering tax diversification now?